ilia, Elia, Olympia, Peloponnese, Travel and Holidays Guide for Greece. Olympia: (1,063 inhab.) the original site of the games where the flame is still lit, can be reached by the mountain road from Kalavrita. At Olympia, there are the ruins of Atlas, a museum of the Olympic Games and two archaeological museums. Olympia can be reached by car along the coast of Ahaia or from Tripoli in the central Peloponnese, both of the drives are very interesting, so it would be worth trying the 334km (208 miles) coastal route via Patras and Pirgos one way, returning via Tripoli, by train (Athens, Patras, Pirgos, Olympia). From Olympia the road turns east and follows the Alfios River through the wild Arkadian Mountains. There is a spa at Loutra. The road becomes hair-raising with a sheer drop of 300m (1000ft) after Isounda, and should only be attempted by the adventurous. The main road from Olympia to Tripoli is less treacherous, going down from the mountains to the plain of Tripoli. At Bassae is the well-preserved temple of the Epicurian Apollo. At Kaiafa there is a hot-spring resort built on an island in the middle of the lake. The picturesque coast of the western Peloponnese offers plenty of opportunities for swimming. Between Killini and Kiparissia, the beaches at Kastro, Loutra Kyllinis, Kourouta, Skafidia, Katakolo, Kaiafa and Kiparissia are popular. 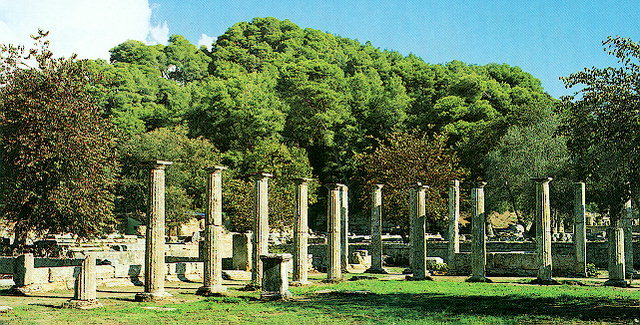 Visit the archaeological site of Olympia. The area has also been designated as a World Heritage Site by UNESCO and the honor is definitely not without due! The site is huge and you'll again need a guidebook to identify all the buildings and archaeological remains. The site can be crowded though since there are usually tour buses full of people lining the parking lots and roads back to town during the spring and summer. The stadium is one of the easiest sites to recognize, but the Temple of Zeus should merit close attention. It held one of the Seven Wonders of the Ancient World, the statue of Zeus. The archaeological museum at Olympia is modern and though it is expensive (it's worth it) it is the best in the Peloponnese. Take special note of the statue of Hermes and the baby Dionysus as well as the statue of victory. Pirgos: The nearby town of Pirgos is the main station for the buses so you'll have to pass through there a couple of times.